What companies often do when they realize that they need someone to fill a “big title” role is find someone “experienced”—someone with many years under their belt holding that same or similar title. Unfortunately, in a high-growth scenario, such hires often start off strong and then level off or fall behind. Sometimes, they even start off poorly because they don’t have a team in place. This requires them to do the work and get their hands dirty, something they haven’t done in a while. Leadership is then left struggling to understand why someone with so much “experience” is underperforming. 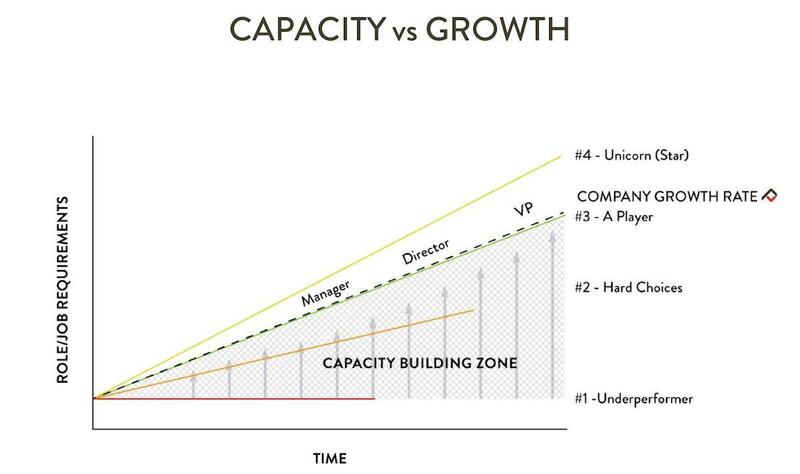 This is where the experienced hire often runs into trouble in a high-growth situation; it’s also where you’re likely to run into trouble as you’ve paid in advance for value and experience, things that can all too quickly plateau. Consider instead focusing on high-aptitude individuals; people who start a little “in over their heads” at each new level they reach. Such people are always in aggressive learning mode, because they want to rise to the next position. Their trajectory and capacity to learn is such that they can stay with your company, growing with its needs. If a less experienced hire can be trained and motivated in 18 months to reach the level of a person with many more years of experience, you’ve gotten yourself a great deal. This is something Bill Belichick, head coach of the New England Patriots, has always understood. Proceed with caution if a candidate has had to change companies often to get promoted. If he’s never been promoted internally, that can be a red flag. Real high achievers move up at wherever they’re employed. 2. Gauge a candidate’s initiative and confidence. A person who asks for opportunities demonstrates that they have the confidence and the interest to take initiative, so keep an eye out for people who are willing to step up and volunteer. For outside hires, consider asking candidates to deliver a presentation and respond to questions. This has worked well at Acceleration Partners. We’ve found the best candidates demonstrate confidence and answer difficult questions with poise. Experience isn’t a bad thing, but it can be expensive and, surprisingly, lead to complacent hires when it’s not combined with aptitude and the ability to grow. High-growth companies will often see a better return on investment (RPOI) by looking for employees who learn quickly and want to advance within the organization, allowing them to grow with your company. This article was written by Robert Glazer from Forbes and was legally licensed through the NewsCred publisher network. Please direct all licensing questions to legal@newscred.com. next A Second Wind of Activism: Will You Rise to Change the Course of History?